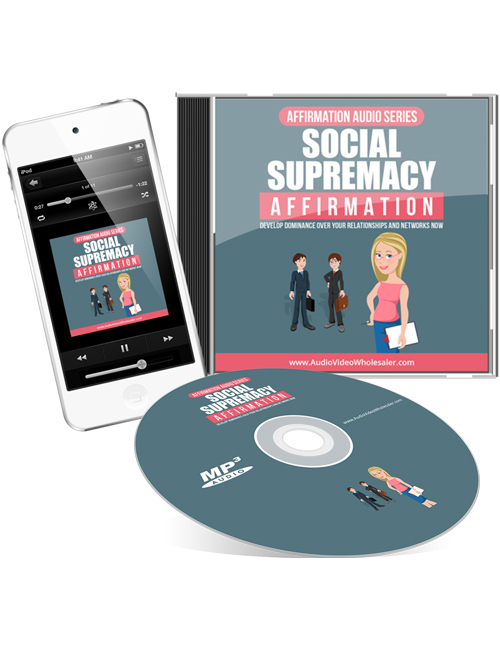 Social Supremacy Affirmation – Develop Dominance Over Your Relationships And Networks Now is a 6 part audio that wakes you up from getting completely sucked in to all the negative forces in your life. Many times people don’t realize that they are going on a dangerous path of self destruction. There could be many different reasons for people to be living mundane lives, sometimes due to no fault of their own. Negative things that affect us since childhood and shape us to become what we are as adults could be a big reason why. Perhaps genetically being low key and unmotivated or lacking in the ability to build relationships could be another reason. Obviously there is no possible way to change the things that affected you growing up and made you feel negative towards yourself and life in general. But the mind is a powerful thing and when you can control it, you control everything else. If you can learn to inspire yourself to be the best version of you, life can become so much happier. To get there, you need to digest the right information. This audio puts you on the right path to help you find solace and happiness simply by listening. If you’re ready for positive change, let it begin here.